We had no real set plan for our trip and that was the beauty of it. The only aim we left the Gold Coast with was to see as much as possible up the East Coast, including the smaller and sometimes forgotten towns. After our goodbyes and a quick stop at K-Mart and Coles we were ready to start our adventure. We ended up leaving the Gold Coast late in fact it was practically dark as we were driving along the M1. Besides heading north we had no idea where we were going nor where we were going to stay for the night, It was all so exciting! Spontaneously we made a random decision to camp in Ipswich for the night. Looking back now I have no idea why we took such a large detour out but that's travelling for you! 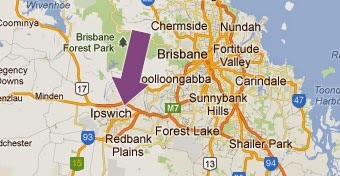 Ipswich is located along the Bremer River valley aapproximately 40 km west of Brisbane. We had found the Ipswich Showground in our 'Camp 7' book. From what we saw in the dark Ipswich was very commercial and industrial (with a showground). It was once a large city of its own, but now its subsumed into the Brisbane metropolitan area. When we arrived ... the first lesson we learnt was that arriving in the pitch black makes everything a lot more difficult. All that was going on at the showground was a netball tournament so we ended up paying some random lady for the site, which we later had to retrieve when the groundsman came over for money. We were then faced with where to go ... followed by putting the tent up in the dark (which was challenging). It was all a bit of a hassle but we did manage it. We were both relieved to sit down for dinner - chicken and beans for Marcus and a yummy chicken salad for me, accompanied with champagne. The facilities at the showground were great despite it being a random choice to spend the night. We also had a very comfy first night sleep on our new memory foam topper (best purchase ever), despite being woken up by diggers removing cow poop from the barn at the crack of dawn, and the noise from a bat tree.